A proposal from City-County Council Democrats seeks to raise about $1 million annually by extending the hours in which parking meters charge fees throughout Indianapolis. The extra funds would be used to pay for more street-sweeping and efforts to tackle homelessness. city. It also would lengthen the times in which fees are collected on certain days and impose fees on Sundays. If the plan is passed, all parking meters would charge fees from 7 a.m. to 9 p.m. on Mondays through Wednesdays, and from 7 a.m. to 11 p.m. Thursdays through Saturdays. And, on Sundays, charges would be in effect from 3 p.m. to 9 p.m. Parking on Sundays currently is free. Right now, meters in the city don't charge fees any later than 9 p.m. and most of them are free after 6 p.m. 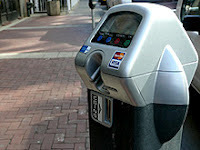 The city has about 3,800 metered spaces. The proposal would do away with the city’s current parking meter zones, which all have different hours during which fees are charged. The downtown core and Broad Ripple zones have the fewest hours during which parking is free. Nowhere in the article is it even mentioned that, in 2011, Indianapolis privatized its parking meters. Under that contract, 70% of parking meter revenue goes to a private company, ACS, doing business as ParkIndy. The parking meter privatization contract is a relic of the Mayor Greg Ballard-era, a period of time when city government seemed hell-bent on funneling taxpayer money to politically-connected companies. Admittedly it has been a long-time since I looked at the ACS contract but I do not recall an exception to the 70% for ACS, 30% for the City share breakdown for extended hours. The contract does provide that once certain income threshholds are reached that the breakdown will become 60-40 in favor of the city, but because those levels are so high and an inflation adjustment is included, it is doubtful that the 60-40 split will ever be reached. In reviewing the ACS (i.e. "ParkIndy") parking contract with the City, I uncovered another trick. The contract has it set up so the split is 30% for the City, 70% for ACS. But when a certain monthly income is reached is reached it becomes a much more favorable 60%-40% split in favor of the City. This was a factor that the Ballard administration used to sell the contract to a skeptical public. The problem is if you look at the numbers closely, and examine the current parking meter revenue numbers, you would know the monthly threshold necessary to hit the favorable 60%-40% second tier will never be reached. According to Schedule 2.1 of the contract, there must be a monthly parking meter revenue of $583,333 to advance to the second tier 60-40 split. (The 60-40 split only applies to revenue above the first tier.) The drafters of the contact used a monthly income of $825,000 to construct an example of how much the City would earn with the $583,333 first tier in place. The estimate is misleading at best, phony at worst. For the four months from March through June of 2011, the total reported revenue was $1,660,910 or an average of $415,227.50 monthly. That figure is nowhere near the amount needed to reach the second tier. But as the rates increase, the second tier target will be hit, right? Nope, it is a moving target. As of January 1, 2012 (conveniently after the election), parking rates will rise from $1.00 to $1.50 an hour. At that point increases are tied to inflation increases as measured by the Consumer Price Index. But the $583,333 monthly inflation first tier ceiling is also adjusted by the Index. The 60-40 second tier split will almost certainly never be reached. The proposal appears to have some bipartisan support. Minority Leader Mike McQuillen told IBJ he was tentatively supportive of the plan but the “devil is in the details.” He said he thought expanding street-sweeping and funding for tackling homelessness initiatives were good ideas.